Requires full backpack. The trails are well maintained, are well marked, and use frequent switchbacks. 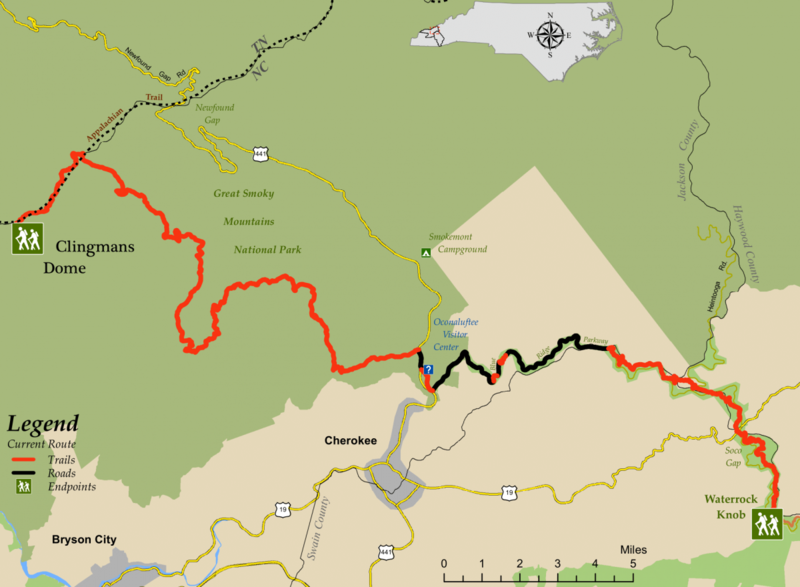 The 46.8-mile-long Segment 1 of the Mountains-to-Sea Trail (MST) begins in Great Smoky Mountains National Park (GSMNP), straddling Tennessee and North Carolina. Newfound Gap Road (US 441), which travels north from Cherokee, North Carolina, to Gatlinburg, Tennessee, forms the backbone of the park and climbs to over 5,000 feet at Newfound Gap. The Smokies may be the most visited national park in the country but only the roads and parking lots are congested. With over 800 miles of trails, even popular trails are not very busy. The trails in the Smokies are well maintained and well marked. Hikers will appreciate that they’re in a national park. The Smokies, in a temperate rainforest, have a great variety of wildflowers, from the first bloodroot in March to the last asters in October, as well as more tree species than all of Europe. But hikers will also see the richness of the community life that was here before the area became a national park in 1934. This segment also highlights the southernmost part of the Blue Ridge Parkway (BRP). Also administered by the National Park Service (NPS), the BRP runs 469 miles from GSMNP to Waynesboro, Virginia, and receives more visitors each year than any other NPS unit. It is a marvel of Depression-era (and later) engineering, and the MST roughly parallels it through the mountains. Heading eastbound, the MST starts at the observation tower on top of Clingmans Dome in GSMNP, on “top of old Smoky” at the state boundary. After paralleling the road to Clingmans Dome for a few miles, it heads deep into the woods on the longest roadless stretch of the MST—22.8 miles with no road access. Emerging to US 441 at Mingus Mill, the segment continues past the GSMNP’s Oconaluftee Visitor Center and Mountain Farm Museum and along the Oconaluftee River, popular for tubing. From here, the trail continues along the shoulder of the BRP for several miles, with two short trail sections to avoid tunnels (in which walking is prohibited). 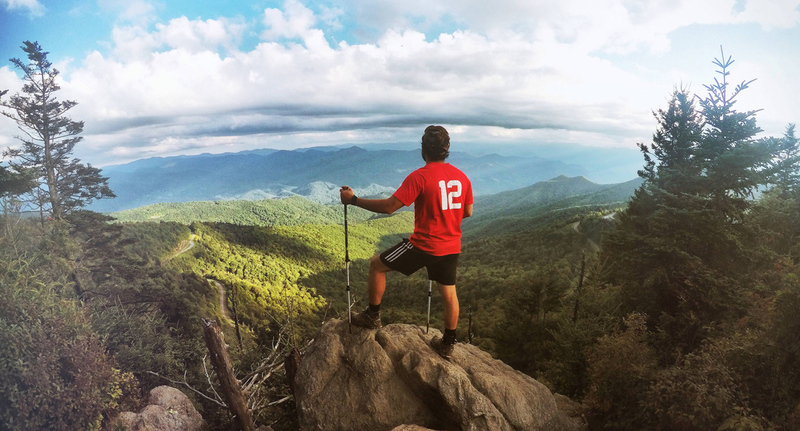 The BRP is famous for the views from its overlooks, and this segment features several. Turning to gravel roads, the route continues through the Qualla Boundary, home of the Eastern Band of Cherokee Indians, before returning to hiker-only trail for the last 6.4 miles to Waterrock Knob.